This post is about installing Oracle Apps 11i using rapid install. This is a very brief discription of the install document provided by Oracle. For details, you can always refer to the official docs of Oracle. I am providing the installation sequence for one of my test instance. I hope this will serve as a fast and simple docs for you to quickly understand the installation and the steps. Basic installation of Oracle Applications 11i is divided into 3 parts. required for installing Oracle Applications. We then create a staging area where we download and extract all the required files. The staging area after extracting the software will look as shown below. You need around 24G for staging area after extraction. Before we start installation we need to create 2 users. One user (APPLMGR) will be the owner of middle tier and other user (ORACLE) will be the owner of database. Assign the primary owner as “oinstall” and secondary owner as “dba” for both the users. We begin installation by running rapidwiz present in startCD/Disk1/rapidwiz/ directory. Below are the screen shots that you will see. I have given the screen shots with my input for your easy referrence so that you can go through the same fast. Welcome screen lists the database version and the technology stack components that are installed with the E-Business Suite. Click on next. You can either make a new installation of upgrade an existing installation. In our case we are going to do a new installation. In case of Express Configuration you supply a few basic parameters, such as database type and name, top-level install directory, and increments for port settings. The remaining directories and mount points are supplied by Rapid Install using default values. If you have previous installation saved configuration file you can give that as input. If you answer No, Rapid Install saves the configuration parameters you enter on the wizard screens in a new configuration file (config.txt) that it will use to configure your system for the new installation. You can either select a single node installation of a multi-node installation. In our case we are going for a single node installation. Select database type. We can either have a Vision demo database or a production database. Production database won’t have any data. Vision demo database will have test data present for our testing. If you are using Vision demo database then your database will need around 130G-140G of space. Else in case of production database space required would be 45G. Set up the Oracle user and base install directory. Once you set the base install directory, all other directories will be set automatically. You can also edit the individual directories like ORACLE_HOME or db file location as per your requirement. Select the type of licensing you got from Oracle. Completing a licensing screen does not constitute a license agreement. It simply registers your products as active. If you select E-Business Suite price bundle then you will see this screen with some of the checkbox grayed. The products that are checked and grayed are licensed automatically as a part of the suite. The ones that are not must be registered separately as additional products — they are not part of the E-Business Suite price bundle. Place a check mark next to any additional products you have licensed and want to register. Some systems require the country-specific functionality of a localized Applications product. For example, if your company operates in Canada, products such as Human Resources require additional features to accommodate the Canadian labor laws and codes that differ from those in the United States. In such situation, select the proper country. In my case there is no country specific functionality. Select additional language. By default US will be selected. If you want to install any more language, then you can always select from the available list. The Select Internationalization Settings screen derives information from the languages you entered on the Select Additional Languages screen. You use it to further define NLS configuration parameters. 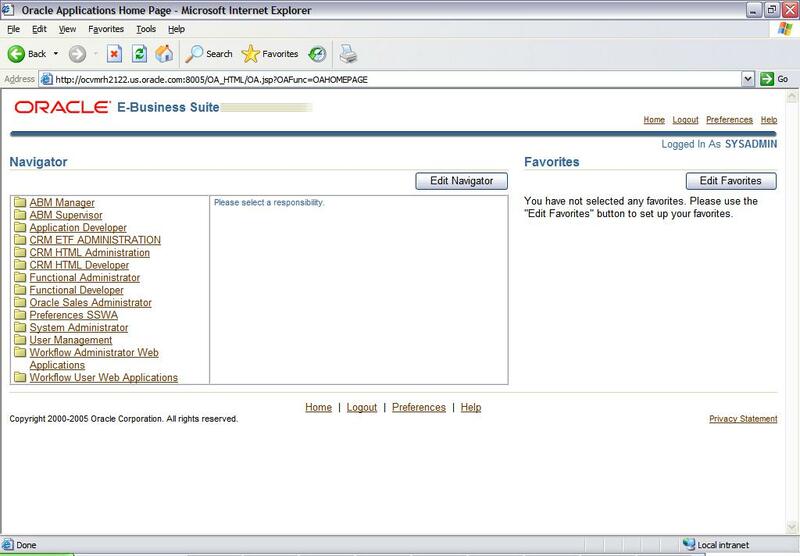 Select the user and base directory for the application side installation. Once you set the base install directory, all other directories will be set automatically. You can also edit the individual directories like APPL_TOP, COMMON_TOP etc. as per your requrement. Provide the domain name and the port ranges. Give the ports that are not used before as per your knowledge. Anyway the installer will check for port conflicts before it installs the application. You can even change the individual port setting as well. You have now completed all the information Rapid Install needs to set up and install a single-node system. The Save Instance-specific Configuration screen asks you to save the values you have entered in the wizard in a configuration file. Review pre-install checks. This will check whether all the requirements are met or not. Once all the requirements are met, please proceed further to install the application. Before installation it will give the summary of the techstack its going to install. Click on next. You can see the progress of installation. Once all the installation is done, it will show the components installed and its status. You can check for the post install steps from the metalink note ID 316365.1 as applicable.